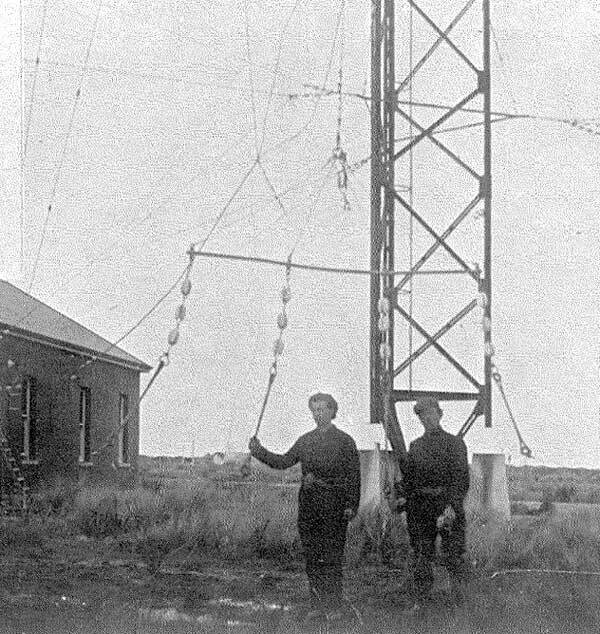 A conference in Melbourne, Australia considered the feasibility of a radiotelegraph link from Australia to New Zealand as a parallel system to the existing submarine communications link. A similar link from New Zealand to Fiji was envisaged. Tenders were called for two New Zealand Government wireless stations, one at Awarua for Australia-New Zealand and one at Awanui for New Zealand-Fiji. Tenders were received from Marconi Co and Australasian Wireless Co which represented Telefunken. Telefunken was the successful tenderer. The cost of the two stations was £25,000. 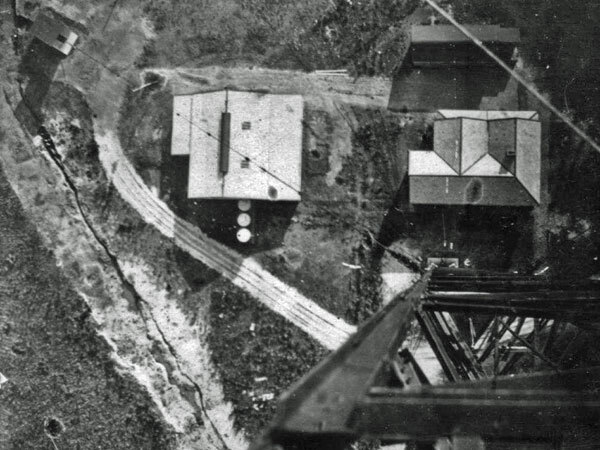 The Awarua Radio tower lowered onto its base insulators. Date unknown. 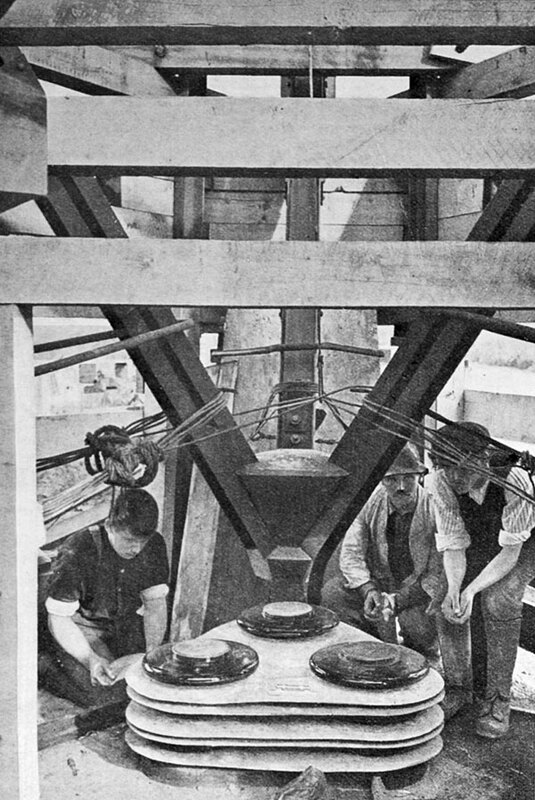 The bottom of the tower was concave, and rested on a ball formed in a large iron plate which sat on the three stacks of insulators. (This plate is in the collection of the Awarua Communications Museum.) The insulators were also separated from each other by more iron plates. Working on the mast at Awarua Radio. The mast was approximately 400ft high and weighed about 60 tons. Date unknown. 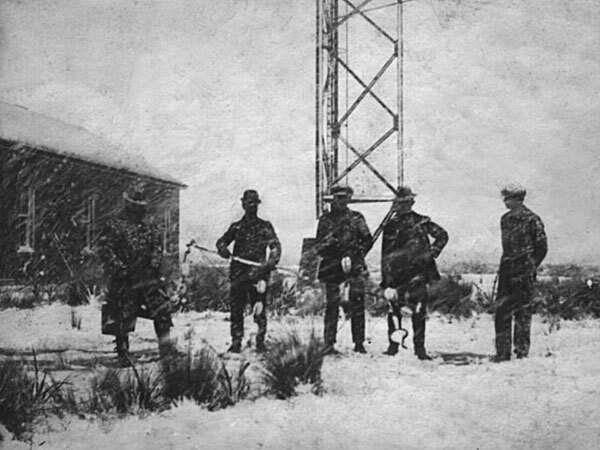 German Telefunken engineers with other workers at the Awarua wireless mast in the winter of 1913. 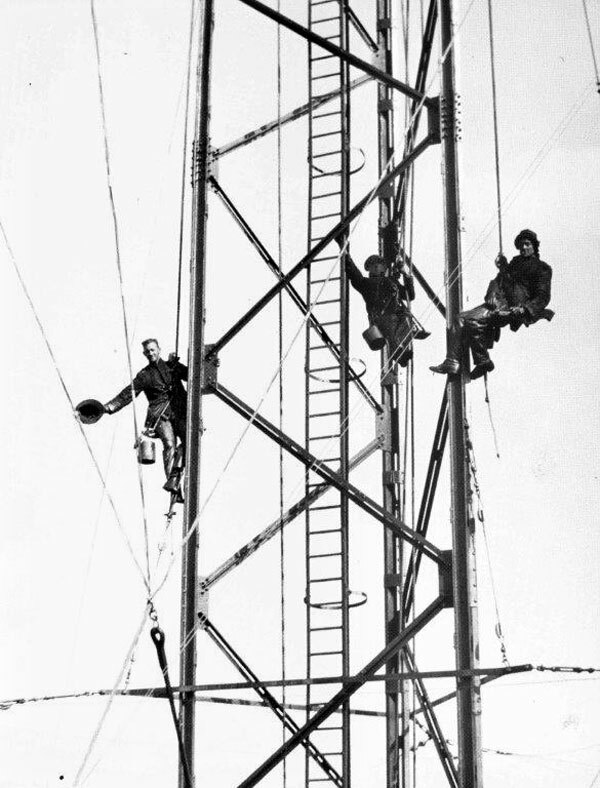 Working on the aerials at Awarua Radio. Date unknown, but probably 1913. Part of the Awarua Radio antenna, possibly being prepared for raising. Date unknown. 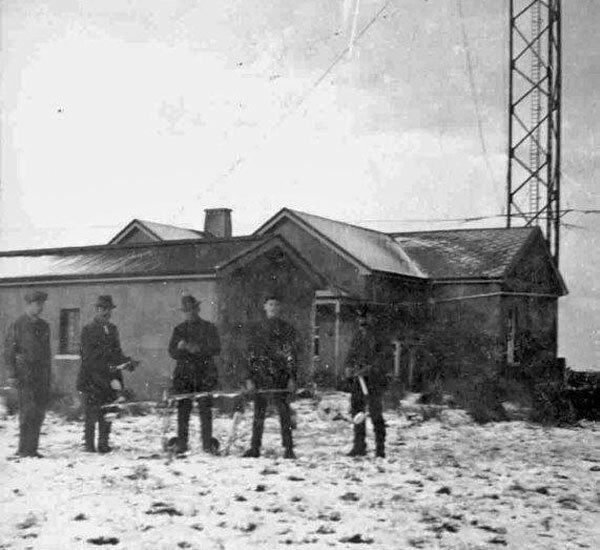 Detail of the original Awarua Radio transmitter building, taken from the previous photo. 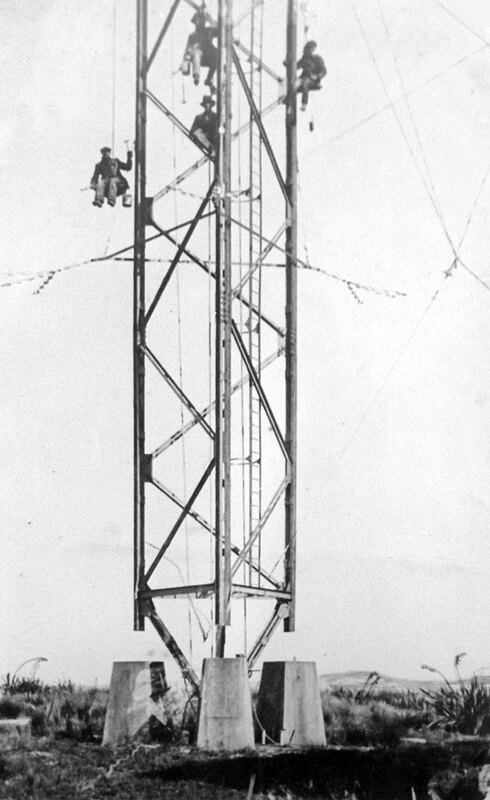 A rigger hangs from the 400 ft tall Awarua wireless station mast c1913. Wireless Station Awarua. 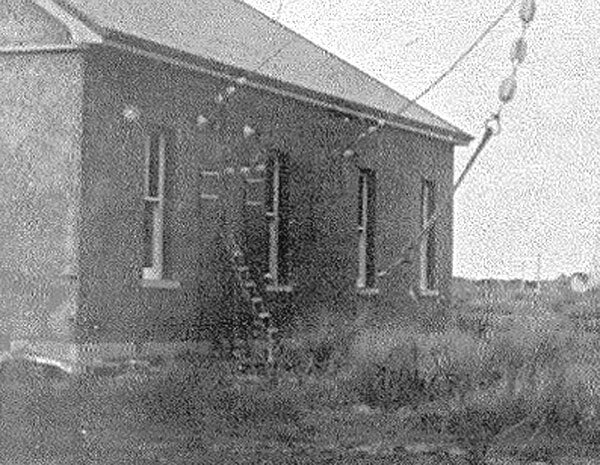 At two points up the tower heavy steel rod supporting stays were attached and led to 20 ton concrete anchor houses on the ground about 800 feet out from the base. 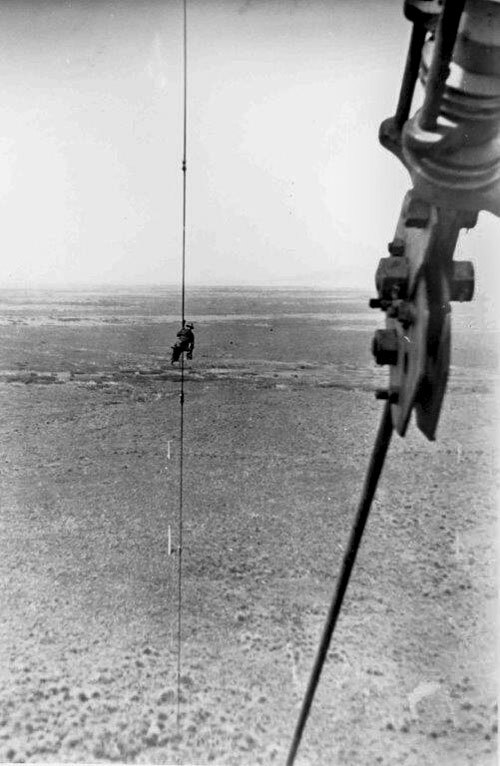 The main aerial comprised a number of bronze wires arranged like the ribs of an umbrella running 400 feet up the tower then outwards 300 feet held by tail wires running to 20 ft poles spaced around tower. 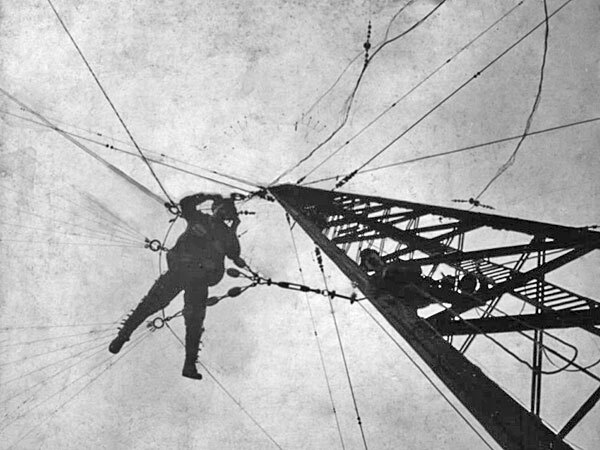 Another 60 wires running back to the tower formed the auxilliary [sic] earthing system (counterpoise). Another account says that the stays were attached at the 150ft and 300ft levels on the tower and were iron rods, broken up by insulators, and that the anchor houses were 42 tons. It also says the height of the tower was 394ft, whereas it is commonly described as 400 or even 410ft. A rigger paints the top of a lower guy just below its attachment to the tower at the 150ft level. 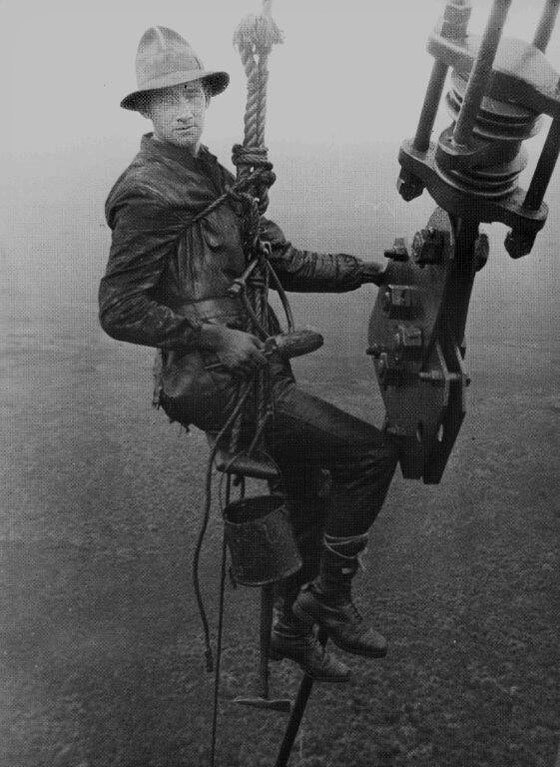 A rigger paints one of the upper guys, photographed from the 150 level of the tower. Looking down from the top of the 400′ mast at Awarua Radio. The transmitter/operating building is at the foot of the tower with the engine house to the left. The northwest anchor block for the tower is at the top left of the photo. Date unknown.